1.Why choose SOMEK K99 portable mini projector? 1) Not recommended for PPT, word, excel or business presentations. 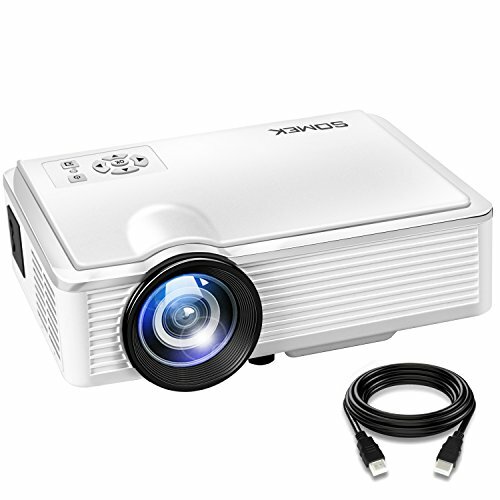 2) To connect the mini video projector with PCs and laptops, please adjust the PC/laptop's display resolution to 800*600 or 1024*768 for best clarity. 3) Dolby is not supported. If there's no sound, please turn off Dolby Digital in AppleTV, Blu-Ray players and Firestick etc. 【20% PLUS LUMENS LED VIDEO PROJECTOR】20% more lumens (2400 in total). The upgraded projector is 80% brighter than the other LED mini projectors. You certainly will not regret to try SOMEK mini projector. 【HIGHEST 840 X 480 NATIVE RESOLUTIONS】Supported resolution:1920*1080, Aspect Ratio: 4:3/16:9, Contrast Ratio: 2000:1, Lamp lifetime: 40000 hours, Watching Size: 20"-150" with projector distance 1.5m-5m. 【MULTIMEDIA PORTABLE PROJECTOR】 SOMEK projector is compatible with TV Box, Amazon Fire TV Stick, Chrome Book, PCs, Laptops, Tablets, Blue-ray DVD player, SD Card, USB Flash Drive, Media players (Music, Pictures, Video, TXT), iPad, iPhone, Android Smart phones ( Wireless HDMI Dongle not included). 【IDEAL CHOICE FOR HOME ENTERTAINMENT】SOMEK LED projector is great for home theater, movies & video games. Don't recommend for PPT presentations. For detailed data presentations, like PDF,Excel,Text files. 【24-MONTHS WARRANTY& 30-DAYS MONEY BACK GUARANTEE】Buy with confidence at any time thanks to SOMEK 30-day money back guarantee and 24 Months Warranty. If your projector has any quality issues, please contact our customer service immediately. If you have any questions about this product by SOMEK, contact us by completing and submitting the form below. If you are looking for a specif part number, please include it with your message.